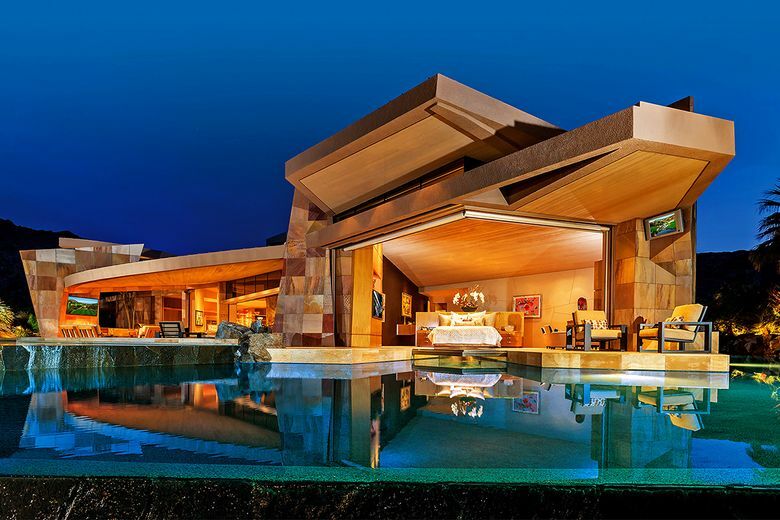 Designed and built for late Hollywood producer Jerry Weintraub, the single-story house combines bold geometric shapes and natural finishes to striking effect. 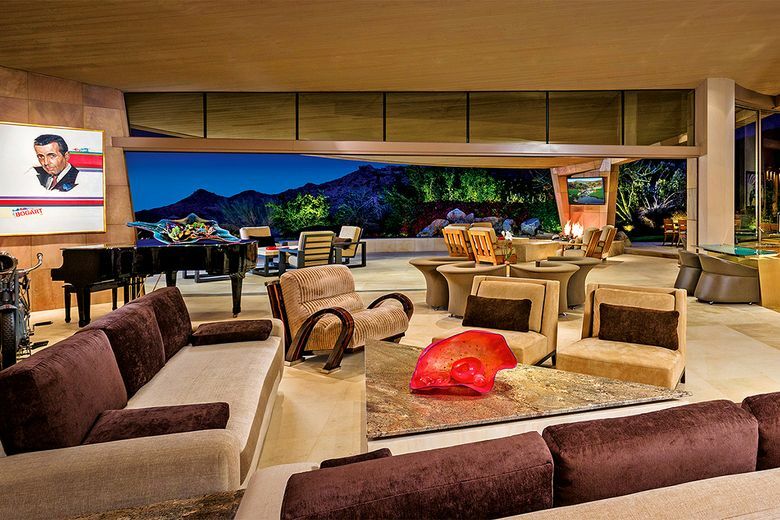 The onetime Palm Desert, California, home of late Hollywood producer Jerry Weintraub returned to market recently for $6.9 million and in three days had an offer. The striking contemporary-style home, which was designed and built for the mega-producer, was first offered three years ago for $16 million. More recently, it was listed at $9 million, records show. A work of architect Guy Dreier, the single-story house combines bold geometric shapes and natural finishes to striking effect. At the heart of the home is a massive common area divided by a floating fireplace feature. Pocketing walls of glass capitalize on the warm-weather climate of the Coachella Valley while opening the space to mountain and golf course views. Also within more than 9,150 square feet of living space is a center-island chef’s kitchen, a home theater, five bedrooms and a gym. 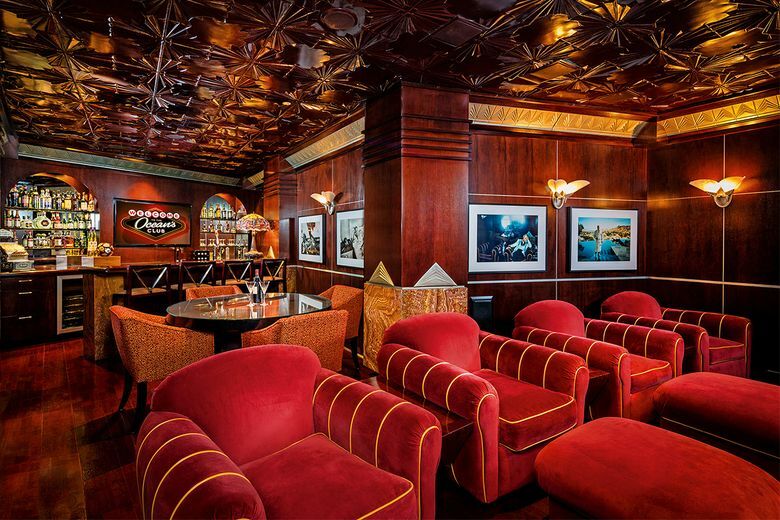 A custom-built bar room was designed to evoke the pub at the historic Claridge’s hotel in London. The house sits on about 1.5 acres in the Bighorn Country Club community and has two infinity-edge swimming pools and two spas. A motor court and drive-through garage also lie on the property. Weintraub, who died in 2015 at 77, started his show business career as a talent agent, overseeing the tours of artists such as Elvis Presley, Frank Sinatra and Bob Dylan. His credits as a producer include the “Karate Kid” and “Ocean’s Eleven” franchises.